Liz Did It: OK, Wendy Did It. I told you I have some crafty sisters. 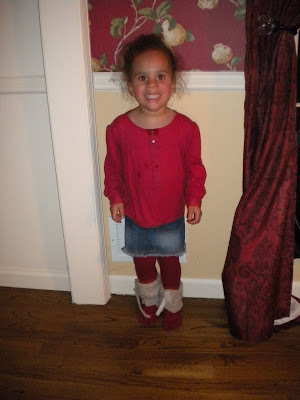 This weekend at my mom's 60th birthday party my niece Samirah rolled in wearing the most fabulous leg warmers. I asked my sister where she got the pattern so I could link to it, but the crafty lady just whipped it up herself, sans pattern! She said it's a simple tube, and she wove some satin ribbon through. Is she not the cutest and most stylish 3 year old around?